America invented popular music. It was on a Tuesday. The entire history of pop can be traced back to traditional American music at the turn of the 20th Century. However, if you read any learned books of learned history, you could be hard-pressed to guess that this is the case. This is all because of The Beatles, who by a trick of fate were born in Liverpool, England instead of Liverpool, Ohio and therefore were not required to fight in the Vietnam war in the 1960s. That's right, Britain stole a march on popular music in the decade that proved to be the most pivotal in the history of the genre and has scarcely relinquished its primacy ever since. American musicians could very easily have pushed the limits of their creativity just as far as their British contemporaries but as soon as they got a groove going they were legally obligated to go and rain hot death on the Viet Cong. It's hard to reinvent rock 'n' roll music when the hot breath of the American Senate is continually on the back of your neck, noisily wondering why it is that, instead of going electric, you're not busy killing Charlie. 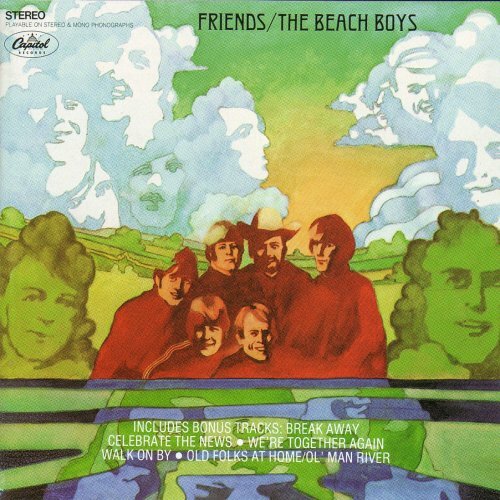 I am always reminded of this state of affairs when I listen to Friends by The Beach Boys, an album which I love. In the title song, there is a line: "I talked your folks out of making you cut off your hair", which I have always believed must be a veiled reference to the continuing US involvement in the Far Eastern conflict. Indeed, I think it could even refer to the youngest of The Beach Boys' Wilson brothers, Carl. "We've been friends now for so many years, brb raining ideological death war on innocent Asian families"
Carl Wilson was drafted into the US Army aged 20 in 1967 but applied for deferment on the grounds of conscientious objection. After a lengthy battle through the courts, the US Government agreed that Wilson would not have to fight overseas as long as he performed free concerts for hospitals and prisons in lieu of national service. Fans of The Beach Boys will know that this was a pivotal year in the history of the group. The year before the band had released their seminal Pet Sounds album and headed into 1967 in a creative summit duel with their great contemporaries The Beatles to see who could redefine the terms of pop music forever first. Of course, we now all know that The Beatles released Sergeant Pepper's Lonely Hearts Club Band in June of that year while The Beach Boys spellbinding and ambitious Smile project collapsed in a fug of mental health problems (Brian Wilson) and in-fighting within the band (Mike Love). They were never really the same force again, especially after the patchy and disappointing Smiley Smile was released that September - a watered down and unfinished collection of what had promised to be the most remarkable songs ever committed to tape. Having a Sword of Damocles hanging over the continued involvement in the group's activities of one of their number was, of course, by no means the be-all and end-all of what caused the breakdown of the group's position at the absolute vanguard of the pop movement. But there's little doubt in my mind that it would not have helped. Carl Wilson's influence within The Beach Boys was growing rapidly. By 1968 he would be their de facto leader as big brother Brian drifted off into a world of his own. The idea of this rather gentle soul possibly having to go and destroy world communism was anathema to everyone concerned. But, and here's the key thing, I can't help but feel that it would actually have been brilliant. For a start, it would have won The Beach Boys a whole new legion of more mature fans and other veterans of foreign wars, flushed with admiration that finally one of these floppy-haired, lily-livered rock 'n' rollers had finally had the balls to stand up to Marx. This could not have served the group badly: their output up to that stage was exceptional enough that any new listener would surely be converted into a fan and, therefore, record sales. Then there would be the immeasurable impact of Wilson's return to the fold, both from the point of view of publicity but also in terms of his new life experiences informing all sorts of new directions for the band's sound. George Harrison playing sitar with Ravi Shankar would suddenly seem old hat, compared with the sprinkling of genuine Laotian folk music now peppering The Beach Boys albums. Perhaps they could even have roped Lon Nol in on bongos. I can't be the only Beach Boys fan who would absolutely have relished the idea of a now one-legged Carl Wilson, wearing an eyepatch, singing a furious song about the 4 Vietnamese soldiers he bayonetted never solved anything. Of course, it could just be that they had a friend whose parents wanted them to get a haircut but they talked them out of it.